alter/amend/delete classes/events if deemed necessary on the day without consultation. Centre Ring nominations will be accepted on the day, however entry fees at centre ring are CASH only no Eftpos is available. ATM is available onsite see program map. 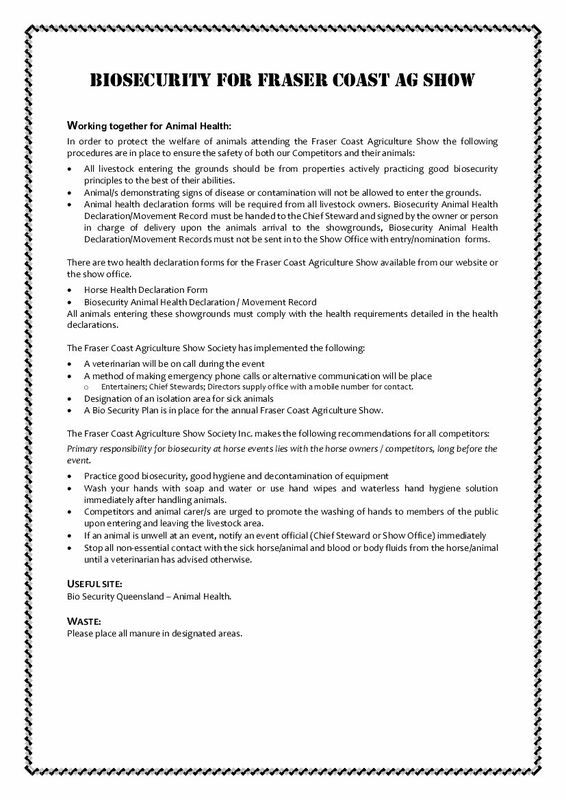 That a printed BIOSECURITY ANIMAL HEALTH DECLARATION/MOVEMENT RECORD and a HORSE EVENT PARTICIPATION WAIVER, RELEASE AND ACKNOWLEDGEMENT FORM + Pre Paid Nomination form or manual entry form BE HANDED TO THE CHIEF STEWARD OR NOMINEE in CENTRE RING (when you arrive) AT THE SHOWGROUNDS otherwise entry may be refused to the competition. These forms are attached or will be emailed to you with your online booking confirmation. I understand it is a condition of my entry that I hereby authorise the Fraser Coast Agriculture Show Society Inc or its representatives, the irrevocable right to use my name, likeness, image, voice, property and/or any performances as captured by photo/video means for release and/or reproduction in any medium for any legal purpose. I acknowledge that I have no interest, ownership or copyright in the use of my name, likeness, image, voice, property and/or any performances and that any use made without compensation or notice to me, I waive any right to inspect or approve and/or otherwise control the use of same in any kind of marketing and media worldwide including online, now or in the future. Online Entries are encouraged to avoid long delays in Centre Ring so classes can run on time. These can be entered by going to www.nominate.com.au Equestrian, Ag Shows, Fraser Coast and choose 2019 Horses Fraser Coast Ag Show or follow this link www.nominate.com.au/equestdn/Nominate.aspx?venueid=74 and choose 2019 Horses Fraser Coast Ag Show. A Horse Participant Waiver, Release and Acknowledgement Form, and a Biosecurity Animal Health Declaration /Movement Record will be emailed to you upon registering your nomination. These MUST BE PRINTED AND FILLED OUT COMPLETELY AND HANDED IN AT CENTRE RING PLUS A PRINTED COPY OF YOUR NOMINATION FORM. If all these forms are not received together, no participation in events can be allowed. Nominations close Tuesday 22 May 2019. The Horse Gate will open at 6:00 am Thursday 23 May & Friday 24 May 2019. Remember, you must hand your ticket for entry into each class to the Steward prior to the event commencing. Clearly print showing rider's name and horse's name. This information is vital to the accuracy of publication by the ring announcer and newspaper. Nominations will be taken on the day at Centre Ring, please allow time to completely fill in the Horse Entry form, Horse Participant Waiver,Release and Acknowledgement Form, a Biosecurity Animal Health Declaration /Movement Record and provide payment before classes commence. Pick up your entry ticket into each class at Centre Ring - upon presentation of your printed nomination. Stables: Stables Must be pre-booked online at nominate, (select Ag shows and click on Fraser Coast then on Horses 2019) and not at the council office at the showgrounds. The stable fees/rates are $7 per night per stable/yard. Bond $23 per stable, 5 horses or more Bond $15 per stable. Stables will be open from Sunday 19 May 2019 to Saturday 25 May 2019. Open yards will be available to Showjump horses which carry the same fee and Bond as the Stables. Booking confirmation MUST be brought to the Horse Gate before entering Stables. Gate Entry Passes: (Discounted Fees): 1 day $12.00, 2 days $18.00, 1 day family pass (2 adults & 4 children) $30.00, 2 day family pass (2 adults & 4 children) $40.00. MUST be booked online. Please print confirmation or bring electronic copy to exchange for Show entry tickets. No confirmation, no Entry. Prize Money: to be collected from the Finance Van Thurs 23 & Fri 24 May 2019 between 10am and 6.00pm. The Finance Van will close at 6.00pm sharp. No prize money payment will be given at Centre Ring. Stallions are not permitted in hack classes, except in classes as listed (Breed Classes only). No persons under the age of 18 years is to handle stallions on the grounds or in the showring. Entrants attention is drawn to the QCAS SPECIAL HORSE REGULATIONS and the BIOSECURITY FOR FRASER AG SHOW INFORMATION LEAFLET. It is expected that competitors attend the Grand Parade, otherwise forfeiture of prize money could occur. Horses competing in Hunter Classes are not eligible for Hack classes and must abide by Show Hunter rulings on correct saddlery and dress code – Tweed jackets and plain browbands etc. horses will be required to gallop in their workout. Horses competing in Hunter Classes are not eligible for Hack classes and must abide by Show Hunter rulings on correct saddlery and dress codes – Tweed jackets and plain browbands etc. horses will be required to gallop in their workouts. Class 1212 Child Rider 8 yrs and under 10 yrs. MINATURE PONY - BROKEN COLOUR UNDER 34"
CHAMPION MINATURE PONY -BROKEN COLOUR UNDER 34"
RESERVE CHAMPION MINATURE PONY - BROKEN COLOUR UNDER 34"
CHAMPION MINATURE PONY - BROKEN COLOUR UNDER 34" - 38"
RESERVE CHAMPION MINATURE PONY - BROKEN COLOUR UNDER 34" - 38"
MINATURE PONY - SOLID COLOUR UNDER 34"
CHAMPION MATURE PONY -SOLID COLOUR UNDER 34"
RESERVE CHAMPION - SOLID COLOUR UNDER 34"
MINATURE PONY - SOLID COLOUR 34" - 38"
CHAMPION MINATURE PONY - SOLID COLOUR 34" - 38"
RESERVE CHAMPION MINATURE PONY - SOLID COLOUR 34" - 38"
MINATURE PONY - ANY OTHER COLOUR UNDER 34"
MINATURE PONY - ANY OTHER COLOUR 34" - 38"
CHAMPION MINATURE PONY - ANY OTHER COLOUR 34" - 38"
RESERVE CHAMPION MINATURE PONY - ANY OTHER COLOUR 34" - 38"